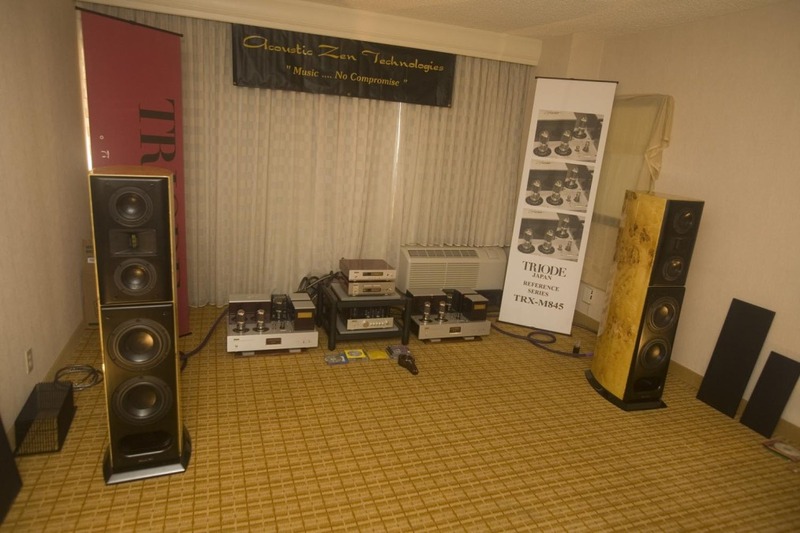 CanJam inspired some people to announce the end of high-end audio as we know it. I will argue that this is completely wrong, both because I believe it to be so, and because I want it to be so. Personal audio is the wave of the present. 1. The primary argument against this being an enduring trend is that this young generation is the most social generation in the history of the world. They cannot live 1 minute without checking to see what their friends are doing. And portable and personal audio is inherently a solitary activity. Sure, someday someone will make it so friends can link their personal audio devices together and all listen to the same thing at the same time. Every group of friends will have their own ‘radio station’ they can tune to. Every school will have their ‘radio stations’ their students can tune to for parent-approved listening. 2. There are primal forces against personal audio. a. The beat. FEELING the beat, man. b. Freedom. Freedom to move around and interact with other people nearby. Talking. Snogging. Being a spousal unit. Being a parent. c. Employability. There are few jobs where being by default unavailable for interaction with customers, colleagues and bosses is acceptable. Software Development is one of those few, but it still is going to hamper your ability to participate in what is becoming more and more a group activity [see #1 above]. Geeky trends hardly ever last. Someone sitting in a corner of the room huddled over a shoebox-sized system? Weird devices in or on their ears? For this level of geek, I, personally, would want, no NEED, to be plugged into the whole Matrix, not some MP3-deck. I want instant Google direct to my brain. I want infinite memory and infinite knowledge just by thinking about it. 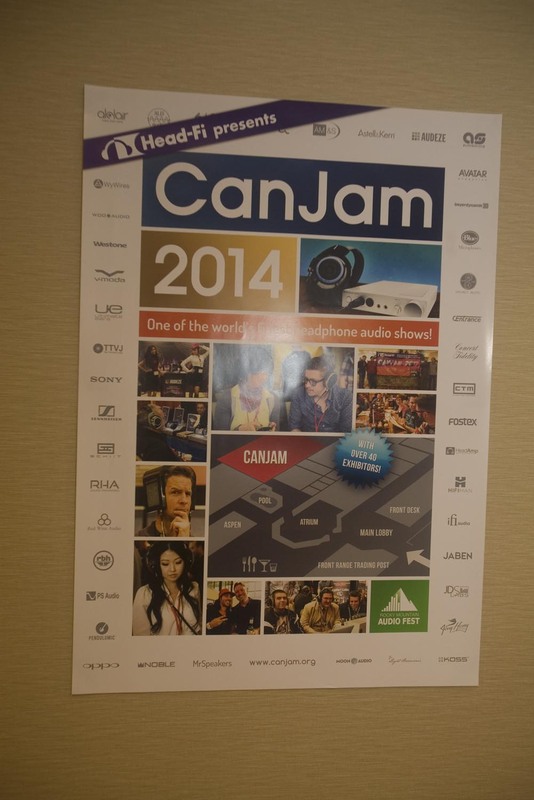 I certainly enjoyed my time at CanJam. People are making a ton of cool gear. Having fun. About half the companies are new and about half are companies who primarily make large systems, trying to participate in the personal audio wave. I don’t know. Personal computers did last about 15 years. So…. Bad me, doing yet another facetious Best of Show report. Have to admit, this show I really wasn’t paying attention to each and every room like I usually do [even though I was actually in 98.5% of the rooms this year]. Then we unexpectedly took over duties as Audio Note UK exhibitors. So that occupied Neli 100% of the day [but, yeah, she loved it]. So my mission became, for the most part, doing one of our old fashioned balls-to-the-wall show reports, inspired somewhat by Leo Yeh and My-Hiend.com [who, I think, was inspired by our old show reports. :-)]. Oh, yeah. Not paying much attention. So this meant that something had to be really good to distract me from my photography duties. Seems like even lame show reporters are getting this one right. The planer tower was not all that obviously a planer speaker. Which is good, it sounded more like music than most planers do. The woofer tower was deep and powerful, communicating emotion, and not missing that much resolution while doing it. A little discontinuity between the towers, especially when the bass was called upon to do something serious. The planers were a bit under-driven, making them a little laid back. But, wow, good separation, good musicality and continuity. 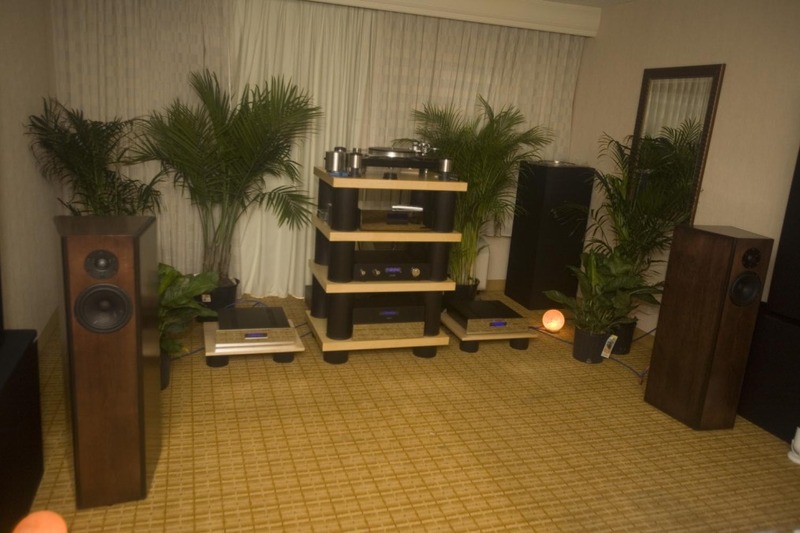 There was nothing blatant, in 3 visits to this room, except perhaps the slight under-driven planers, that conveyed that this was not a mega-buck front end instead of the modest, typically reasonably-priced PS Audio gear. For me, this raised PS Audio from middle-of-the-road mass-market gear to a real contender that probably should be replacing some of the big 10 brands in some of your old-style dealerships. These are great speakers and I wish they were still being made. They seem to struggle with taming the bass each show – though they seem to be getting better and better at it. For me, there still seemed to be a sameness to the bass, from track to track, when it should be different from track to track – but it could have been the room. 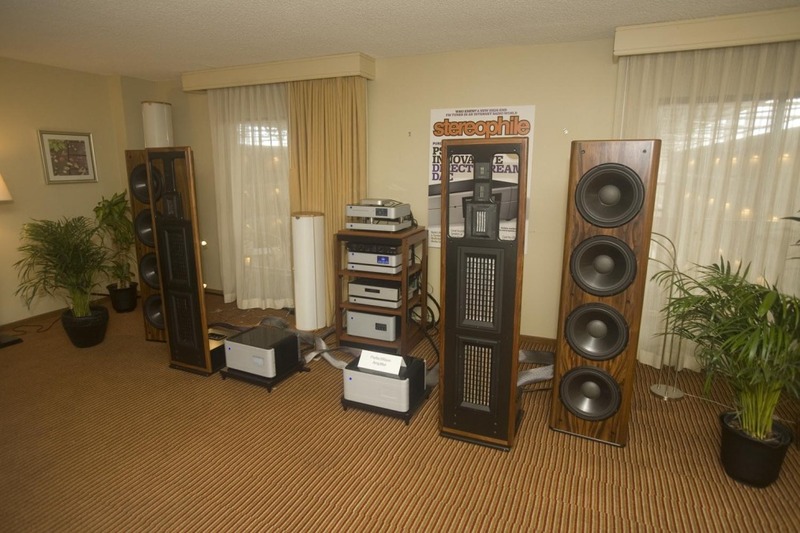 Otherwise, I think these are some of the best speakers on the market [and I hope Francois bought a pair]. I think I might have liked them better with FM Acoustics at the Newport Show, compared to the 200 watt Thrax hybrid that they had on them Sunday, but it was close. I know. Every show. 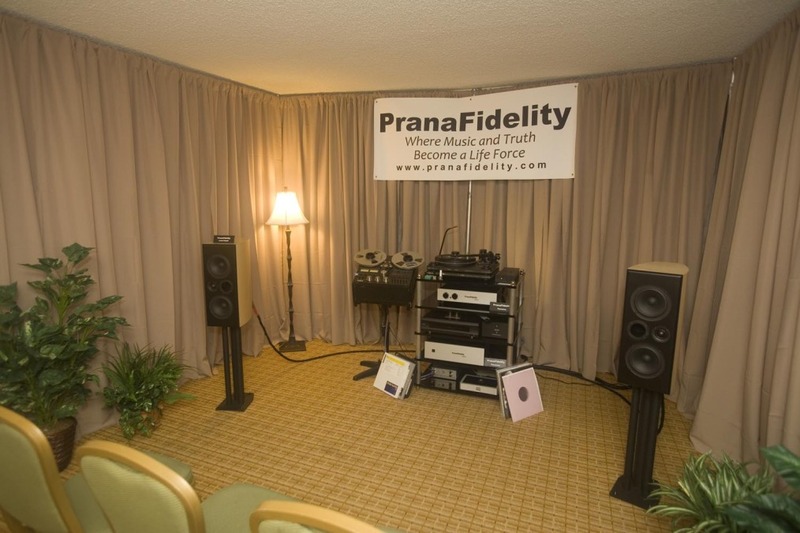 But I liked the Prana Fidelity, the Acoustic Zen and Odyssey Audio rooms. As always. [just what the heck were you playing there Klaus? One of the refrains was “If I only had a brain” (one of my favorite songs – and often my mantra.). I also thought the speakers in the MG Audio Design room had potential, but the brand of the speakers is still not known to me. 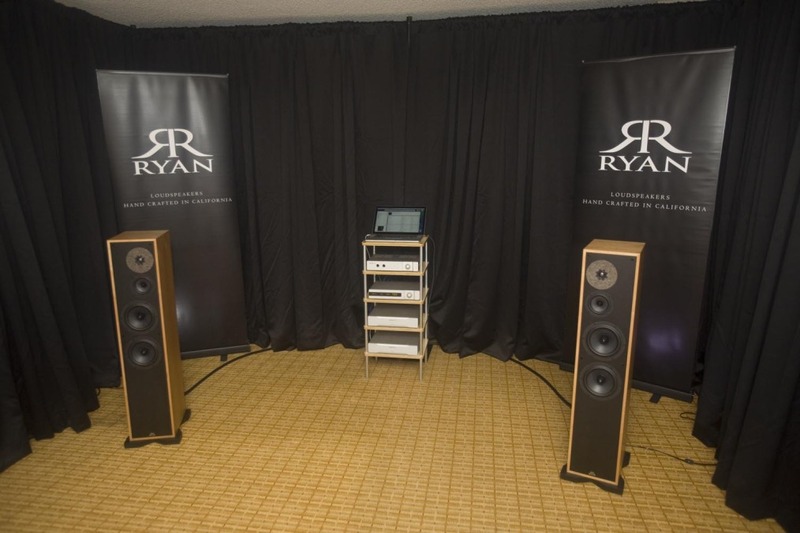 Kevin and several other people mentioned that they liked the Ryan speakers room, so I am passing that on here [I did not stop to listen, or they were not playing music, or… in any case, I did not get to consciously hear them, myself]. If I was young this is what I’d get. A little grainy [especially when the Peachtree is called upon to fill a GIANT room like that] but not excessively so for that price range. It is such a joy to be in this room. 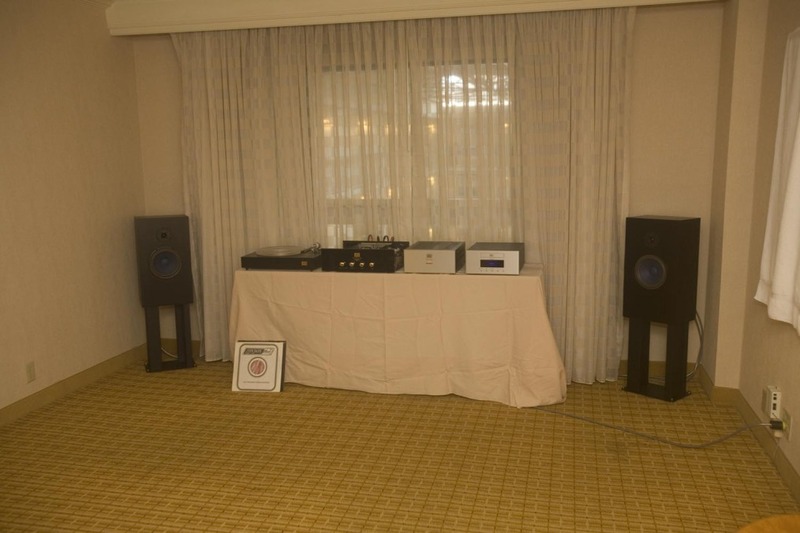 RMAF 2014 – Audio Note U.K.
Neli wonders if we are becoming Audio Note addicts. 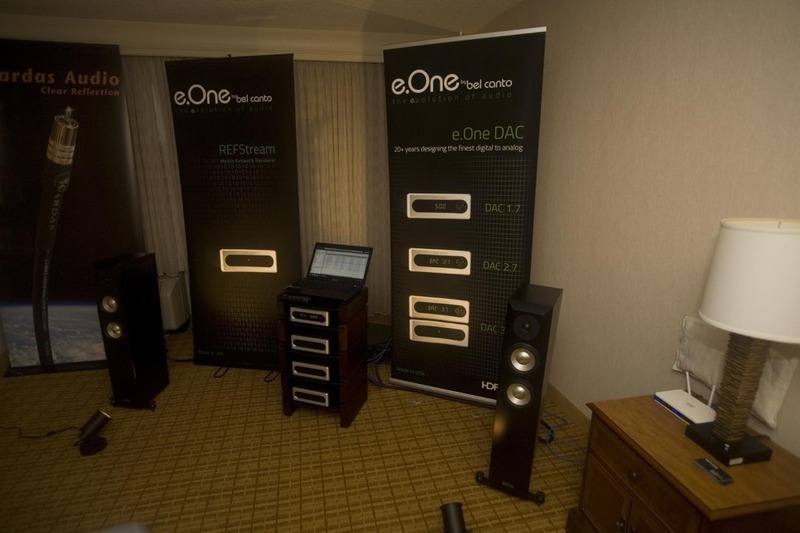 This year the room featured the little $4K Audio Note J/D speakers. Each day, I would go into about 80 rooms. Hear 80 different stereo systems. Some good. Some better. Most not at all awful. Then I would come back to the Audio Note room. See if Neli needed something, coffee, whatever. The sound here is just so different. It is like in this room we are listening to music and all the other rooms are making dinka-dinka-dink sounds. Sorry if that offends some people. And, truth be told, if you would offer me a choice between this and the PS Audio and the Infinity IRS Beta speakers system or the Thrax and Polymer speakers system I would take them, in a heartbeat. I like playing with gear and exploring the different ways music can sound. I LOVE hearing different soundscapes and hearing ever deeper into the music. But, you know, I wonder if most of this gear we play with isn’t really making music more real. That we are just playing with music, ‘photoshopping’ music. Like photoshopping a picture of the beach, instead of BEING AT the beach. The photoshopped picture can actually be made to look better than the real beach. But it still isn’t the beach. Addicts? Yeah, I wonder too. Essentially, we agree with Pez, but… there are a lot of ‘buts’. Sound: Does it really matter? First, a strange and terrible fact is that sound does not affect sales in a significant way. Pez alludes to this when describing how the major brand’s rooms do not sound very good. We’d say it adds 10%, maybeeee 20% to sales to have good sounding rooms at shows. To most exhibitors who have good sound, it is more a point of pride than an effort to increase sales. So many exhibitors, after several years of stressing about the sound, just see bad-sounding rooms selling gear just fine and wonder “what’s the point?”. ‘Good sound’ is only one of many, many reasons people have for buying a particular piece of gear. To expect a setup to be optimized is expecting a lot. Typically, we were just happy as can be that the system actually came on and played music. 🙂 Travel and shippers are not kind to electronics gear. We were happy with a grade C setup with a 36 hour pre-show continuous play warm up – getting the system to settle in. Of course we tried for grade ‘A’, and once in awhile we got a grade ‘B’. I am not sure I have heard a grade ‘A’ setup at a show. Trying not to be Romyesque here, but I do not think I have been to a home that had better than a grade ‘D’ setup in place. 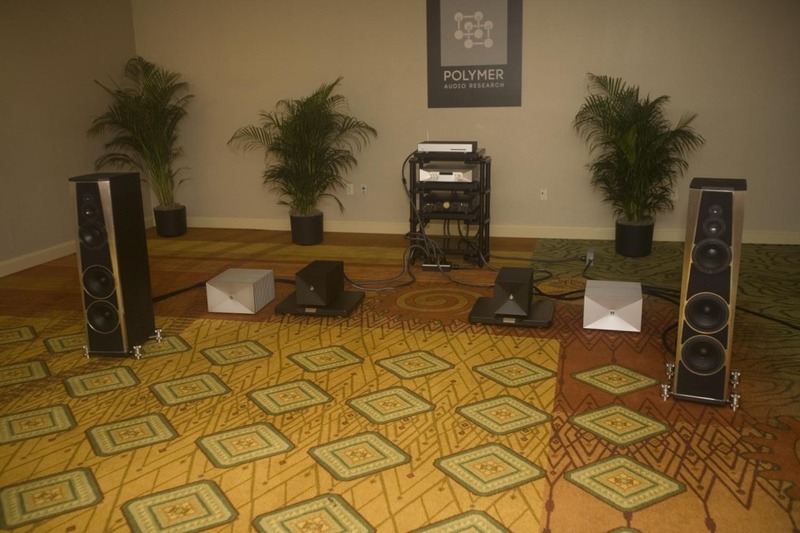 Another strange and terrible fact is that most speaker manufacturers do not know how to setup their own speakers. At all. To a large degree this is because they have never heard them optimized, i.e. paired with optimal gear, and so do not know what quality of sound they should expect – what sound to look for – that they need to keep adjusting things until they get this sound. Obvious exceptions are Acoustic Zen, Evolution Acoustics, PranaFidelity, Audio Note, Odyssey – mysteriously the same people with good sounding rooms at most shows. Legacy WAS better this year, which is kind of disturbing…. Skipped VTL / Wilson this year – tired of Bea Lamm shooing me out of the room . 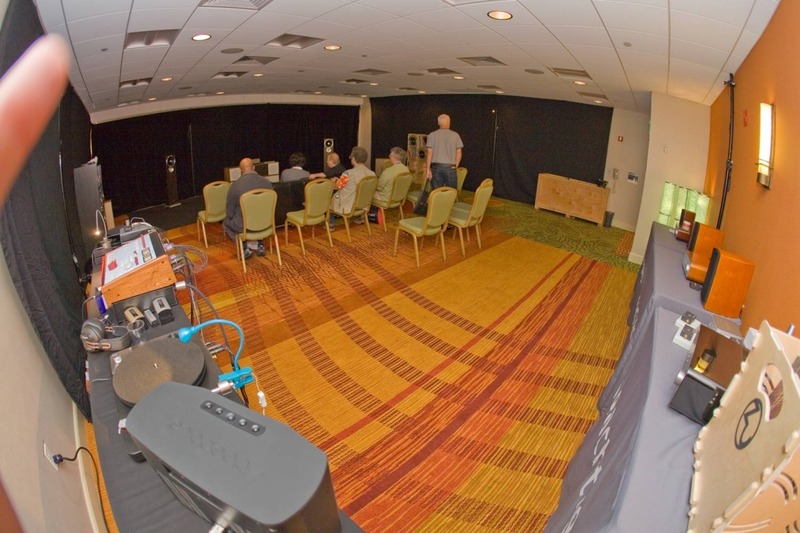 Didn’t get into Nordost, do not really have a half hour to sit still for a 1/2 hour demo and was not able to catch them between demos. 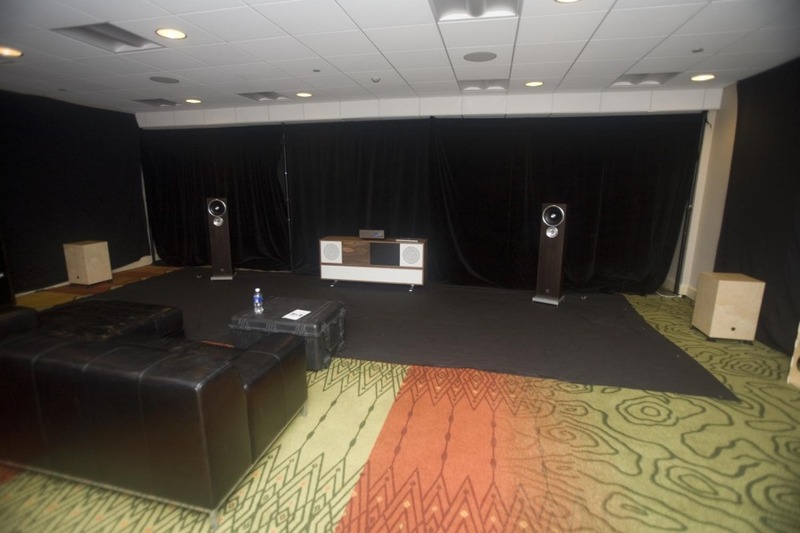 John Barnes [Audio Unlimited, a local dealer who had I think up to 6 rooms some shows] used to complain about some of the problems these big rooms were causing with the quality of the sound. But On a Higher Note did just fine in Longs Peak, and Zu Audio [ and before that Gamut (KT Audio Imports)] sound great in the giant room, so…. maybe the two middle rooms are cursed? It is unfortunately true that some of the gear in the system has never before been seen by the people setting up the system. Then it all is shipped to the room and the first person to arrive gets the joy of setting it up as best as they can. This does have the advantage of keeping the exhibitors from being bored :-). We always tried to get people to send us the gear to our shop a week or more before a show; gear which we would then lug to the show ourselves when the time came. This helped the sound because we could hook it all up ahead of time, keep it warmed up, and learn ahead of time what to optimize for – but this is not always possible. no first reflection treatment???? WTF???? We are not room treatment fans. Kind of feel we have to speak up – because we see so many rooms ruined by room treatments. It is kind of a dark secret that windows are OK, and untreated walls are OK. Much of the time. We feel treatments are only necessary in certain circumstances. If you are along a long wall, or catty corner, or using horns, or severely toed in, or have a dull sounding room [which standing-room-only rooms quickly turn into] then first reflection treatment is not really necessary and can add problems. Be happy. This is going to fix itself. What Pez is really saying, of course, is that the show could be so much better if exhibitors cared more about the sound and treating people like people. This we agree with 100%. The way the market is going, people are going to shows to hear gear, and buy gear. With the deluge of new brands of gear, and new micro-dealerships, people will now be able to much more easily avoid dealing with bad sounding gear and impolite salespeople. They are no longer stuck just buying the big 10 brands anymore. This leveling of the field of play, which the internet is primarily responsible for, means small brands can look as big as large legacy brands. More and more people are choosing to buy gear from smaller brands and from nicer people.